I finally decided to get this after a lot of consideration...too much consideration, because this is the kind of thing that ought to be built into Studio (don't worry PAs, I know you need to sell textures too). :) I'm sure people have requested a male version as well, and I'd also love to see expansion sets like more brows, veins, more blemish patterns, lip textures, and such. I'm having a problem with Skin Builder 8. I can't get to some of the "Apply" buttons. They are off the bottom of my screen (see attached file). How can I correct this? My screen resolution is set at 1366X768. I've tried all of the resolution settings and it has not helped. 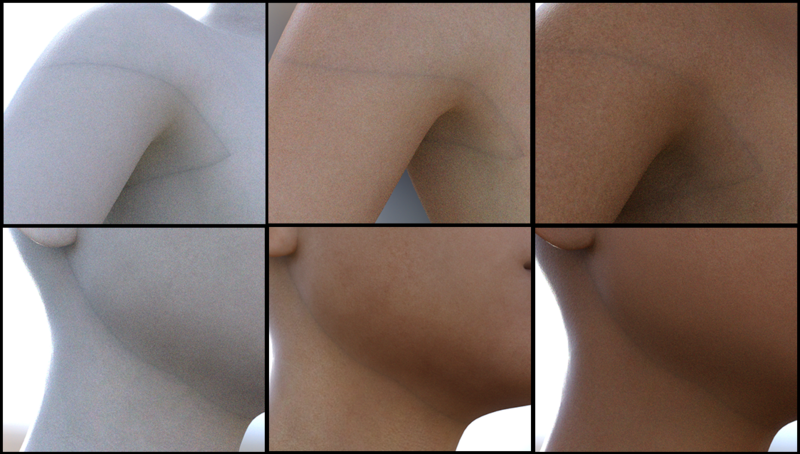 Unfortunately Skin Builder uses standard 1080p as base resolution. Try changing in windows display, the scale and layout percentage. It might be larger than 100%. If that does not work feel free to return the product. The script window cannot be made any smaller unfortunately. That's disappointing. I have Skin Builder 3 and I've been looking forward to Skin Builder 8. Now I find I can't use it because my screen resolution won't go high enough. The scale setting is at 100%. The resolution won't go any higher than 1366X768. I was hoping to use it as a merchant resource. I've created some characters I would love to market, but if I understand your merchant resource agreement correctly I can't use Skin Builder 3 for Genesis 8 characters. Once again, you create a great product that continues-on DraagonStorm's legacy! For SkinBuilder 3 you only allowed to sell for Genesis 3 Female characters, but you can include a Genesis 8 character morphs set where the skins are shared, that is allowed. But NO Genesis 8 Female Standalone character is allowed for sale using Skin Builder 3. For SkinBuilder 8, same rule applies, you can include a Genesis 3 Female character morph version, But NO standalone Genesis 3 Female character is allowed for sale using Skin Builder 8. The native figure for the respective Merchant resources must be present. Hope that makes sense. Anyway. I would be interested in a male version of this script. I'm interested only in that. The chicks have enough support. Why are there so many do not click things in the smart content version of this? My notebook resolution will not go any higher than that either, but I have an external monitor which I can use, but that is the same thing I use to watch tv and movie discs. I am gathering that skin base color tint is a shader based thing instead of a actual texture color change? They are helper scripts called by the main script, as far as I know, and probably need parameters passed to them from the main script to do anything useful. Because the main script embeds them into tabs. They tell SkinBuilder how to apply the overlays. They are in the Dim and Manual Zip versions as well. They are not meant to be clicked on. We could not hide the files since they are actual scripts, so next best thing was to add a do not click icon. If I buy G8 version will it work on my G3 versions or do I have to purchase both ? I am totally confused about how to use this. Also it seems that my notebook screen is too small for the main screen which means if I want to use it I have to connect my external monitor. I do not know when I when I can get a desktop and using the secondary monitor is not always handy. I am thinking of returning it for those two reasons, but mainly because my current computer screen is too small. If I ever get a desktop, I might get it again, if that is okay. Before I ask my question I must start by praising the creaters of skin builder! It's an awesome product and I coudln't (read: wouldn't want to) live without it! So, to my question: Yesterday I sat for quite some time with Skin Builder 8 to get the perfect shade for a new character I'm creating. After I'd finished I notice quite visible seams along the edges of the textures on the character. Today I did some experimenting and have now discovered that all three textures that can be applied with a slider (in other words pale, light and medium) have these quite visible seams (shown in the image below). The darkest default textures look good however and don't have any seams. Is this a known problem that will be fixed in an upcoming update soon? The textures have no seam issues that I am aware of. Are you using a custom shader? Earlier today when "experimenting" I started a new project, loaded up the "genesis 8 basic female" and opened up Skin Builder 8 and got this. What's strange though is that I haven't noticed this before yesterday.. I will try to uninstall/reinstall skin builder and see if that helps. And if that doesn't work I'll try to reinstall genesis 8 base figure too. I'll post here after I've done that (not tonight I think) and tell you how it went. Are you using Spectral Rendering in Render Settings? Try disabling that and see if the seams go away. Check to see if you are using the correct UVs for the G8F and also that you are not using Chromatic as a setting for the Surfaces on the G8F skin. I purchased Skin Builder 8. The problem, asking to create the "skin" for the model that I just did nothing. The creation message appears but it is false. The same thing happens with the base model of G8F. Hi. I need more info. What version of studio is being used? You need a version later than that for the script to work properly.